We’re delighted to be joined this month by guest Blake Howard, who first mentioned his love of Michael Mann to us over two years ago! We made a note of this, and thought this month would be an ideal time to invite Blake onto the show to talk through his love of one of modern cinema’s most divisive auteurs. And that led us to another idea. From the beginning of the show, whenever we’d described our middle segment to people – the part of the show where we would often deal with topical issues facing cinema – we would always cite “film vs digital” as the sort of thing we’d debate. Only recently did we realise we’d never actually covered that topic, so this felt like the perfect time. With film preservation in the news lately thanks to quotes from Christopher Nolan and Quentin Tarantino, and with Michael Mann being one of the pioneering figures of digital cinema, we thought this was the time to finally address cinema’s biggest 21st century debate. But that’s not all! We also look at some key new releases of this month, including Robert Zemeckis’s The Walk, Justin Kurzel’s Macbeth, and Brian Helgeland’s Legend. So download or stream us from our website, listen in via Stitcher Smart Radio, or subscribe to us via iTunes. No matter how, where or why you consume the show, we hope you enjoy it. Blake states in this episode that he thinks Stanley Kubrick might have embraced digital technology. He’s not alone: Steven Soderbergh has made a similar claim. And although Blake was talking about digital photography and Soderbergh was talking about digital projection/home cinema, it’s an interesting point to consider. This entry was posted in blogs and tagged blake howard, michael mann on October 31, 2015 by The Hyphenates. Sydney-based writer and film critic Blake Howard joins Sophie and Lee to look back at the key films of October 2015, including THE WALK, LEGEND and MACBETH. They then tackle the perennial issue of film vs digital, and look at where the debate stands in 2015. 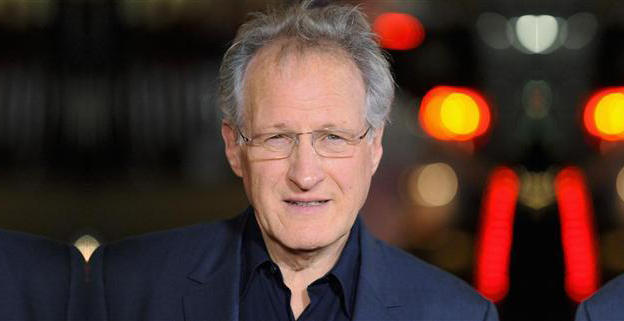 Then Blake takes us through the career and films of the great US auteur Michael Mann. This entry was posted in podcasts and tagged 17 days down the line, ali, blackhat, blake howard, collateral, heat, insurrection, jaunpuri, la takedown, legend, macbeth, manhunter, miami vice, michael mann, public enemies, the insider, the jericho mile, the keep, the last of the mohicans, the walk, thief on October 31, 2015 by The Hyphenates. 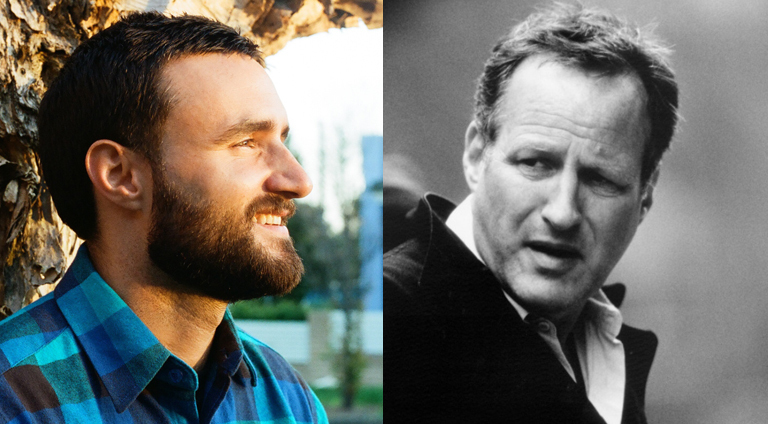 There are few filmmakers with such distinct periods to their career as Michael Mann: there’s the Celluloid Mann and the Digital Mann. There’s also the Running Man, but that was directed by Paul Michael Glaser, and we don’t want to confuse you. Of course, there’s a lot more to Mann than just film vs digital, but if we’re going to give you the complete Michael Mann experience, this is the obvious binary to go with. The first film in your evening’s viewing is Heat, the 1995 crime film that finally united Al Pacino and Robert De Niro on screen (The Godfather Part II doesn’t count because they never shared a scene, and Righteous Kill doesn’t count for a variety of reasons). 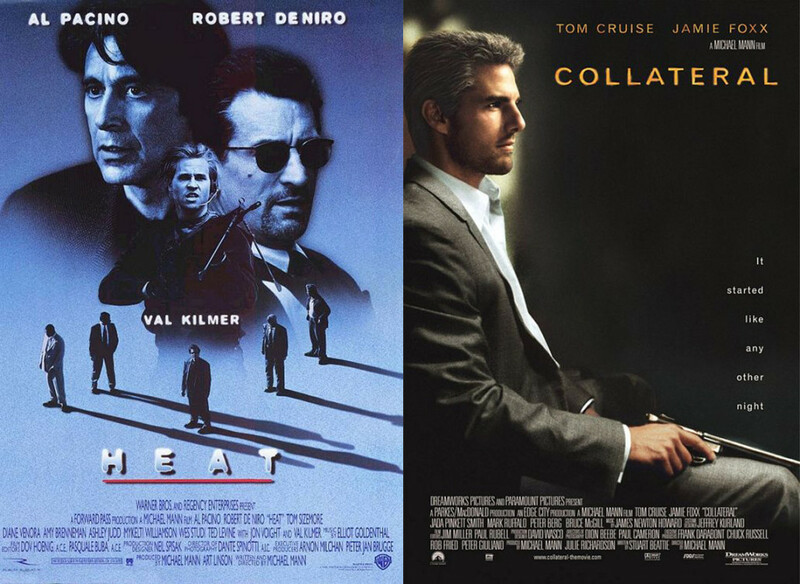 Heat is one of the great crime epics, the epitome of the Career Cop vs Career Criminal showdown. When you’ve finished that, follow it up with 2004’s Collateral, which is probably the epitome of the Career Criminal vs Cab Driver crime epics. It’s the first feature Mann shot exclusively on digital, and the best-received of Mann’s 21st century oeuvre. Clear an evening this weekend, throw these two films on, and you’ll be an instant expert in what makes Mann Mann. Substitutions: Can’t get or have already seen Heat? Then check out 1986’s Manhunter. This was the first on-screen appearance of Hannibal Lecter, beating Silence of the Lambs to cinemas by five years. And a lot of film fans actually consider Manhunter to be every bit the equal to Silence. Will you be one of them? Find out! If you can’t get or have already seen Collateral, check out 2006’s Miami Vice. Look, it’s not a universally beloved film, but like Collateral it demonstrates the visual and narrative aesthetic that Mann’s been so keenly exploring. The Hidden Gem: Want to see something from off the beaten path? Check out 1979’s The Jericho Mile, Mann’s first feature (albeit made for TV, so if you don’t count those, then, I don’t know, don’t watch it). It’s not talked about as often as his other works, but it’s a hell of a debut and will leave you with little doubt as to why his career took off so quickly. The next episode of Hell Is For Hyphenates, featuring Blake Howard talking Michael Mann, will be released on the morning of October 31 (AEST). This entry was posted in blogs and tagged blake howard, cheat sheet, collateral, heat, manhunter, miami vice, michael mann, the jericho mile on October 22, 2015 by The Hyphenates. The new era of Hell Is For Hyphenates is here! What will it sound like? Nobody knows! You’ll have to tune in on October 31 to find out. But this is a show all about the guests, so allow us to introduce our October 2015 Hyphenate, Blake Howard. Blake is a film critic, writer and podcaster based in Sydney. He’s the editor-in-chief and co-founder of Graffiti With Punctuation, the popular Australian film and TV website. He began as the co-host of That Movie Show on 2UE, and currently co-hosts the podcasts Pod Save Our Screen with Maria Lewis, and The Debrief with Cam Williams. Thankfully, he’s not too podded out, and will be joining us at the end of the month to talk some more film. But which filmmaker has Blake chosen to talk about? None other than the master of the modern crime noir, Michael Mann! Michael Mann is probably best known for the 1995 crime thriller Heat, which pitted Al Pacino and Robert De Niro against one another for the first time, finally seeing the pair share the screen after their missed connections in Godfather Part II. Prior to then, Mann had put himself on the map with the likes of The Jericho Mile, Thief, The Last of the Mohicans, and the first on-screen appearance of Hannibal Lecter in Manhunter. Recently, Mann has been noted for his foray into digital photography, creating his own aesthetic long before the rest of cinema had gone digital. From 2004’s Collateral onwards, his films took on a distinct look that has divided critics and audiences. From Miami Vice to Public Enemies to this year’s Blackhat, Mann has established a visual texture that is unlike that of any other filmmaker. But what is it about Mann that appeals to Blake? Join us on October 31 to find out! This entry was posted in blogs and tagged blake howard, michael mann on October 8, 2015 by The Hyphenates.